Did Feminism Destroy Common Courtesy Toward Pregnant Women? 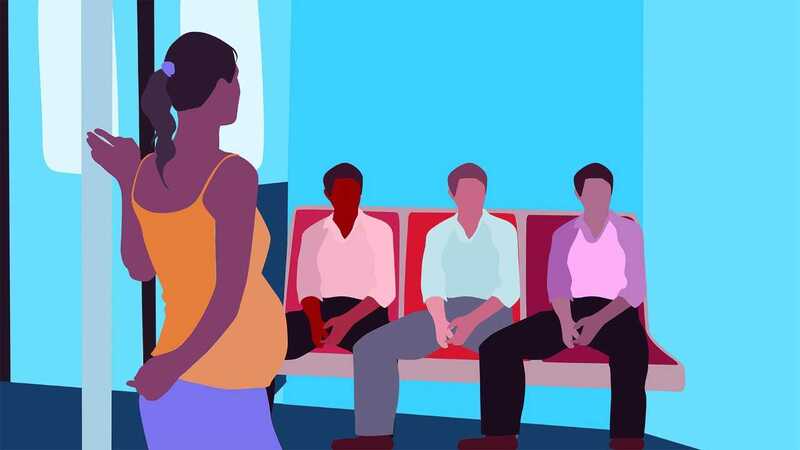 I watched as a very pregnant woman boarded the crowded bus. I assumed someone would offer her a seat before she got to where I was in the very back but no one did. I watched school kids on their phones, grown women and men of all kinds half-glance at her and turn their heads away. I stood up and offered her my seat. “Maybe it’s just because it’s winter,” I told myself, since bulky clothes meant people were less likely to notice this woman was so obviously pregnant. But I wasn’t convinced. After all, I had spotted her from a distance. Surely, someone else must have too? I didn’t think much of the incident after that — until a couple of years later when I got pregnant myself. I had zero expectations about anyone offering me any consideration or special treatment. Even when I started to show around five months along, I still didn’t want anyone to offer up their seat — perhaps because I was being macho and thought, “Hey, I don’t need anyone’s help.” It was a good mentality to have, because as the weeks and months passed and I became larger and more blatantly pregnant, still no one helped me. By the time I was about eight months pregnant, clearly showing to all the world, it was springtime, and no bulky clothes were hiding my giant belly. That’s when I started to feel differently about the world so blatantly ignoring me and my belly. At eight months pregnant, I’d get tired pretty quickly and would have loved to sit down. I would stand on the bus hovering over able-bodied adults who would turn away and stay seated. I started getting to the bus stop early so I could be first to board, thus increasing my chance of scoring a seat. But even worse than refusing to offer me a seat, people were flat-out rude to me. Not only did no one extend a courtesy like holding a door, they did one worse and literally pushed past me. You know, because I wasn’t walking as fast as I normally could due to the bowling ball I was hauling around, but if you’re not going to hold the goddamn door for the pregnant lady, the least you can do is wait for her to walk through it. Why did shoving past a pregnant woman into a doorway become acceptable social behavior? More: Are Americans Alone in Their Obsession With Baby Showers? I took to putting my elbows out when I walked — aggressively protective, trying to avoid someone smashing into my uterus. My good friend who was pregnant at the same time reached out one day. She asked if anyone had extended me any kindness in public and I relayed that they hadn’t. “Me neither,” she said. So she decided to start wearing a button. It was big and yellow and read, “Baby on board,” and she wore it on her coat in the hopes that people who might have otherwise missed the message that a skinny woman with a giant belly usually indicates. I was excited to see what would happen. Would the common courtesies return? I reached out a few weeks later to see if anything had changed — if magically the general public could now read the signs, literally, and realize they should be kind. “Not once,” my friend reported back. “No one offered me a seat or any consideration.” I was stunned. I was raised to always help the old lady across the street, to give the homeless man food, to give the pregnant lady my seat. I couldn’t believe these basic courtesies were dead as a doornail. Was feminism to blame? Was it because millennial men are being raised to believe women are equal and don’t require special treatment? Or does everyone just have their heads up their butts and in their phones so much that they literally don’t see the world or those in need around them? Or do they just choose not to see or to care? Has the feminist pendulum swung too far in the other direction? A few days later, I boarded a crowded train during rush hour. I was nine months pregnant. Another woman boarded holding a tiny baby strapped to her front. No one offered either of us a seat. I walked over to what appeared to be an able-bodied man and tapped him on the shoulder. I pointed to the woman with the baby and motioned for him to get up. He did. I beckoned to the mother, who looked gratefully my way and took the seat. Of course, no one else got the hint and offered me a seat, but I felt vindicated. I continued to do this — asking parents with small babies or children if they wanted a seat, and then facilitating for them, asking people who looked healthy and strong and perfectly capable of standing on the bus or train to get up and give their seat up. Of course, I was making an assumption as to who might be able to oblige and I recognize that not all disabilities are visible. But more often than not, there was a young man who had no problem giving his seat up; he just hadn’t thought to extend the courtesy without someone pointing out that he should. And then, a glimmer of hope emerged. Just days before I gave birth, a man held the door for me as I was leaving a store. I was so stunned I almost forgot to thank him. Not 10 minutes later, I boarded the train car, and a woman and her friend started to get up and offered me their seats. After months of waiting for this moment, I felt immediately guilty. I didn’t want anyone doing anything for me. I could fend for myself! Perhaps courtesy isn’t entirely dead, but until I become convinced that it’s at least on an upswing, I’m going to continue taking matters into my own hands and asking people to give their seat to others in need. And I hope that by the time he’s, oh, 7 or so, my baby will give his seat up to pregnant people too.